The industry is moving on several different fronts in the embedded memory landscape. On one front, traditional solutions are advancing. On another front, several vendors are positioning the next-generation memory types, such as FRAM, MRAM, ReRAM and even carbon nanotube RAMs, for the embedded market. The new memory types have been in the works for years, and some are even shipping. Chip customers are now taking a harder look at these technologies, as the current solutions may not address all of the problems. In one simple example, today’s MCUs integrate several components on the same chip, such as a CPU, SRAM, embedded memory and peripherals. The CPU executes the instructions. SRAM is integrated on the chip to store data or frequently used instructions. Then, embedded memory, such as EEPROM and NOR flash, are used for code storage and other functions. Fig. 1: Standard embedded NOR flash technology. Source: Silicon Storage Technology. SRAM and embedded memory work, but these technologies have some limitations. SRAM is fast, but it takes up too much space on the chip. Embedded memory is reliable but slow. Chip customers will continue to use the traditional technologies for many applications, but future systems may require something different, namely the new memory types or the existing ones at more advanced nodes. But should chip customers stay with the traditional solutions or move to the next-generation memory types for embedded apps? There is no simple answer. The traditional solutions are known quantities based on CMOS processes. But while the new memories boast some impressive specs and can even replace traditional embedded memory and/or SRAM, they also have some issues. These technologies rely on relatively exotic materials and switching mechanisms. To be sure, it’s a confusing landscape. To help the industry get a handle on the market, Semiconductor Engineering has taken a look at the status of the new embedded memory types and the challenges ahead. Next-generation memory types are targeted for various markets, such as embedded and high-end systems. For high-end systems, there is an explosion of data, causing a growing bottleneck or latency gap in systems. To solve the problem, the industry has been searching for a new memory type that fits between DRAM and NAND in the traditional memory/storage hierarchy. For this, the candidates include MRAM, phase-change and ReRAM. Some new memory types are beginning to ship in various parts of memory/storage hierarchy, while others are still on the runway. A few technologies will never make it—they are too expensive and difficult to manufacture. So, it’s still too early to say where these technologies will eventually land in systems. “You are seeing many, many types of memories. You see at least 10 varieties, maybe more. People are still thinking about ways to work on certain things to solve the problems,” said Raman Achutharaman, corporate vice president and general manager of the Etch Business Unit at Applied Materials. It’s a similar scenario in the embedded market, as the industry is still sorting out these new memory technologies. Basically, the embedded chip market involves ASICs, MCUs and system-on-a-chip (SoC) designs. These devices are embedded in a multitude of applications, such as automotive, consumer, industrial, IoT, medical and others. Another flash memory type, NAND, is not used for embedded memory in MCUs. It’s used for storage in flash drives, SSDs and other products. Generally, NOR dominates the embedded memory landscape. Today’s embedded NOR has 40nm feature sizes with 28nm in the works. In the lab, Renesas has fabricated embedded NOR at 16nm/14nm, but this won’t appear for several years. NOR has some limitations, however. It requires a byte- or sector-erase operation before the write operations. “Write speeds are very slow compared to other memory technologies. Also, the endurance is somewhat limited,” Eggleston said. Embedded flash also may require up to 12 extra mask steps, thereby impacting cost and complexity. In addition, NOR is running into problems as it scales to 40nm and beyond. “Starting at 40nm, the characteristics and performances of NOR flash are degrading,” said Sylvain Dubois, vice president of marketing and business development at Crossbar, a ReRAM chip startup. Going forward, customers could stay with NOR. They could also move NOR outside the MCU. But this solution would take up too much real estate, and security is an issue. So what’s the best solution? “It hasn’t been resolved yet,” Ng said. It’s still too early to say which technology will prevail over the long haul. They need more time to develop, he said. Over time, though, the industry will likely use several next-generation memory types. “I would expect these advanced memories to first find homes in applications that recognize or leverage one of their unique advantages,” said David Fried, chief technology officer at Coventor. To be sure, though, the re-emergence of ferroelectric RAM (FRAM) is a big surprise. For years, FRAMs have been shipping in several embedded applications, although the technology has taken a backseat to MRAM, phase-change and ReRAM. Today, Cypress, Fujitsu and TI are shipping FRAM-based chips. Using a ferroelectric capacitor to store data, FRAM is a nonvolatile memory with unlimited endurance. FRAM is faster than EEPROM and flash. FRAM performs an over-write function in the memory cell without an erase operation. Basically, an FRAM cell consists of a crystal structure, based on lead zirconate titanate (PZT). In simple terms, the outer portion of the crystal is lead. By applying an electric field, zirconate/titanate ions move inside the crystal. Then, the capacitor plots the polarization of the ions. And finally, data is stored in the form of “1” or “0”. FRAMs are also limited in terms of scaling. To solve these and other problems, NaMLab and a spin-off company, Ferroelectric Memory (FMC), are pioneering the development of a next-generation FRAM, dubbed a ferroelectric FET (FeFET). FMC, NaMLab and GlobalFoundries are working on FeFETs for the embedded memory market. In the lab, GlobalFoundries devised a one-transistor FeFET technology into its 28nm CMOS logic process. FeFET is also ideal for an embedded memory solution within GlobalFoundries’ 22nm FD-SOI platform, according to Martin Trentzsch, senior section manager for technology and integration at GlobalFoundries. Fig. 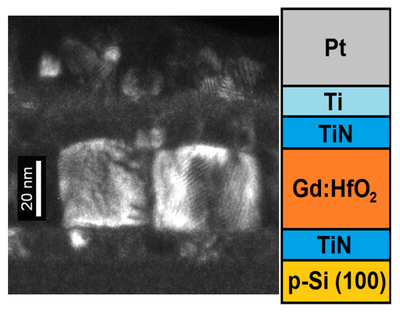 2: Transmission electron microscopy image in dark filed mode of a ferroelectric HfO2-based capacitor structure. Single HfO2 grains with similar crystallographic orientations are visible. Source: NaMLab. Besides FeFET, GlobalFoundries is also developing another embedded memory technology type–MRAM. Intel, Samsung, TSMC and many others are also developing MRAM. Offered as a standalone device or as an embedded memory solution, MRAM delivers the speed of SRAM and the non-volatility of flash with unlimited endurance. The industry is currently developing a second-generation MRAM technology called spin-transfer torque MRAM (STT-MRAM or ST-MRAM). In STT-MRAM, the storage element consists of a one transistor, one magnetic tunnel junction (MTJ) memory cell. “When a bias is applied to the MTJ, electrons that are spin polarized by the magnetic layers traverse the dielectric barrier through a process known as tunneling,” according to Everspin, an MRAM supplier. Everspin is shipping a standalone ST-MRAM using a perpendicular magnetic tunnel junction (pMTJ) technology. This is 256-Mbit DDR3 product. A 1-gigabit ST-MRAM is in the works, which represents a breakthrough. “With perpendicular MTJ, (ST-MRAM) can be scaled,” said Er-Xuan Ping, managing director of memory and materials within the Silicon Systems Group at Applied Materials, in a recent interview. Everspin is also working on an embedded version of the technology. Designed to replace EEPROM, flash and SRAM, Everspin’s embedded MRAM technology is integrated in the last two metal layers of a standard CMOS logic processes using just a few mask steps. Generally, STT-MRAMs are challenging to make, however. “There are still numerous obstacles for developing MRAM products, such as MTJ short fail, relatively narrow sensing margin and MTJ patterning difficulties,” said Y. J. Song, a principal engineer with Samsung. Basically, an MTJ consists of a thin barrier layer of magnesium oxide (MgO), which is sandwiched by two ferromagnetic layers based on a cobalt-iron-boron (CoFeB) compound. The barrier layer is only ≤1nm. In the fab flow, the CoFeB/MgO/CoFeB stack is formed using deposition. Then, the stack is etched, forming the MTJ cell. Problems could surface if these steps aren’t precise. Shorts can occur, thereby impacting yield. “If you use conventional etch technology, these materials reactively sputter and then re-deposit on the sidewall of the structure. That re-deposition shorts out the device. It’s a killer,” added Rick Gottscho, executive vice president of global products at Lam. To solve the problem, Samsung has devised several new manufacturing techniques. For example, instead of a traditional etch process, Samsung has devised an ion beam etching (IBE) technology, enabling it to reduce the short fails below 1 ppm. Using IBE and other techniques, Samsung has fabricated an embedded 8-Mbit STT-MRAM within its 28nm process. “(The device proves the) feasibility of eMRAM commercialization for IoT applications,” Samsung’s Song said. For its part, GlobalFoundries plans to offer embedded MRAM within its 22nm FD-SOI platform. In one example of an application, an MCU could incorporate embedded MRAM and SRAM. MRAM would replace embedded flash for code storage. Another technology, ReRAM, is nonvolatile and based on the electronic switching of a resistor element material between two stable resistive states. ReRAM delivers fast write times with more endurance than today’s flash. Many are targeting ReRAMs as a replacement for NAND, although ReRAM is also geared for embedded apps. For example, China’s Semiconductor Manufacturing International Corp. (SMIC) is developing 40nm embedded ReRAM based on the technology from Crossbar. This will enable embedded ReRAM for MCUs and SoCs. Developing ReRAMs with good cycling and stable retention at high temperatures is challenging, however. Cost, of course, remains an issue for both ReRAM and MRAM. For years, the industry has been talking about carbon nanotube FETs for logic. Carbon nanotubes are cylindrical structures, which are strong and conductive. NRAMs are targeted for standalone and embedded. “It’s based on carbon nanotubes, which are either in contact with each other or not in contact with each other to form high resistive and low resistive states. So you have very distinct ‘0s’ and ‘1s’. This is because there is a large difference between the ‘on’ and ‘off’ state,” Schmergel said. Fujitsu is making NRAMs on a foundry basis for Nantero. In 2018, Fujitsu is also expected to offer the first NRAM products based on 55nm technology with 40nm in the works. While suppliers of the new memory types are making progress, they still face an uphill battle. Cost, integration and manufacturability are just some of the issues. A long list of new memory types is hitting the market, but which ones will be successful isn’t clear yet. Experts at the table, part 1: DDR5 spec being defined; new SRAM under development.